From the excitement of the Baton Rouge jazz festivals to the delicious Louisiana cuisine, visitors to the city are captivated from the moment they enter the town. Located on the eastern bank of the Mississippi River, Baton Rouge is the capital of Louisiana and is home to almost 235,000 residents. This city is a great location for a family vacation and a perfect place to begin your dental journey with a new holistic dentist. With plenty of dentists to choose from, Baton Rouge has what you need to get out of dental pain quickly. The Emergencydentistsusa.com website is where you need to begin your search for a holistic dentist in Baton Rouge. Our convenient listing of holistic dentists is designed to make your search a breeze. Just scroll through the list and click on the dentist that offers the services and office hours that suit your needs. Our comprehensive website provides you with driving directions, office hours, and even insurances accepted with just a few simple clicks. The dentist finder hotline is a great alternative for anyone who does not have internet access and needs a little help finding a new holistic dentist. Call our toll-free number and speak to a caring agent who is standing by to help you choose a great dentist. Your agent can even set up your first appointment for you. Remember to bring your photo ID, dental insurance card, and your dental copayment with you to visit your new dentist. Arrive at least 15 minutes early to ensure that you have time to fill out the necessary paperwork and ask any questions that you might have for the dentist. The Baton Rouge area is a great place for anyone with a dental problem that requires immediate attention. Our top three holistic dentists are listed below, to make your search a breeze. Description: When a dental emergency strikes, Dr. Lejeune is standing by to help you right now. Cypress Dental is a great choice for holistic dental services that include sleep apnea treatment, TMJ treatment, and general dental services. Even cosmetic dentistry is available through Cypress Dental, utilizing only biocompatible materials. Description: Putting patient care first is the goal at Sherwood Dental Care. A friendly office staff works hard to ensure that your dental experience includes state-of-the-art technology and optimum comfort. Using biocompatible materials and offering a variety of services, Sherwood Dental Care is a great choice for all ages. Description: Catering to families, children, teens, and seniors, this Baton Rouge dental clinic provides general care along with cosmetic services. From TMJ treatment to handling sleep apnea issues, Dr. Ryan is caring and considerate of all of his patients. Biocompatible materials and low radiation x-rays make this dental office a great source for anyone seeking holistic dental care. The decision to choose a holistic dentist in Baton Rouge does not mean that you are stuck with starting your dental journey from the beginning. This type of decision does mean that you are working toward whole body health and that you are concerned about the types of materials that are used in your body. From biocompatible materials to low dose x-rays, a holistic dentist is always trying to ensure that your health is at the forefront of your dental care. 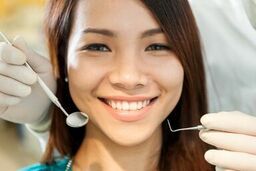 Practicing everything from general dentistry to cosmetic services, a holistic dentist is a great provider for anyone who wants to become active in their healthcare. Visit the Louisiana Dental Association website to gather current licensing and credentials to ensure that your new holistic dentist is the right choice for your dental needs. This website provides visitors with easy access to current licensing and all you have to do is enter your dentist’s name in the search box and click the “enter” button to view licensing items. You can also find this type of information in your new dentist’s office by speaking with the dental receptionist. Most dentists offer this information right in their office.